Luxury auto brand BMW has been on the global road to tout its new line of alternative powertrain BMW i vehicles. The year-long, seven-city “Born Electric” tour hit New York City on Tuesday, and will stick around until the 18th in a pop-up environment. The venue showcases the new BMW i8 Spyder Concept and next-generation BMW i3 Concept, both unveiled on Tuesday. The company says the BMW i3 and i8 will become the first purpose-built electric and hybrid-electric production vehicles to be made primarily from carbon when they become available in 2013 and 2014, respectively. On Sixth Avenue between 41st and 42nd streets, the show, "The Future Is Closer Than You Think," is open to the public from 6 to 10 p.m. each night and all day Sunday. It will host a roster of talks and displays on significant mobility challenges facing America’s largest cities, urban issues in general, and potential technological solutions. One of the visually arresting elements is a digital "window" providing a look at Sixth Avenue as it might look in a few years. The "Window into the Near Future" display, via BMW and AOR Kirshenbaum Bond Senecal + Partners, is something of an extension on BMW’s EVolve app, a digital program for drivers to understand the performance of all-electric vehicles. 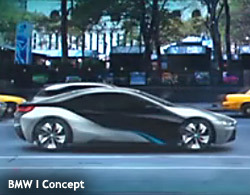 The live window transforms traffic into BMW i3 and i8 concept vehicles using car-tracking technology that matches the movement and cadence of passing vehicles. It also mirrors the street, weather and scenery conditions, except it imagines the street as it might look in the near future. It shows stats about the environmental impact of replacing passing cars with BMW electric vehicles. “The greatest population increases in the future will occur in the world’s already crowded cities, which will further stress their mobility infrastructure and create a need for new vehicles and technologies that make getting around easier and more efficient,” said Ludwig Willisch, president and CEO, BMW of North America. He said BMW i's mission is to address transportation challenges in booming cities that will only get more crowded and overburden infrastructure. As part of all this, BMW i will host a sustainability-themed "hackathon" this Friday through Sunday at www.sustainhack.eventbrite.com/#. Teams of developers have to create an original app that deals with environmental problems facing major cities. A group of judges will decide the winners of the contest based on the team’s ability to "clearly articulate what the app does, the originality of the idea and whether the app is native to iOS and Android operating systems." New York is actually the fourth city the tour has visited. It started in Rome in June, then went to Dusseldorf and Tokyo. After New York, the tour will travel to London in January and Paris in March, and finally Shanghai in June.